Dinner is Served...the Desert Locust! 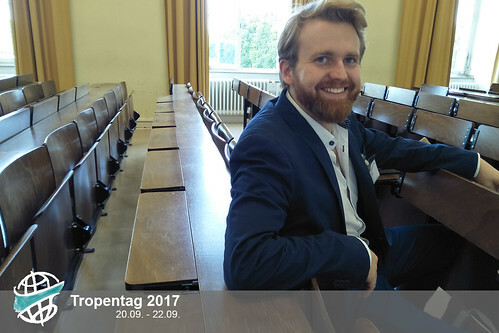 Phillip Straub, a first-time participant at Tropentag has developed a diet for the desert locust. The outstanding young German researcher submitted an abstract from his Bachelor’s degree thesis. He was overwhelmed after hearing he was selected for an oral presentation. To say the least, he was very excited. Philip is convinced that insects for food is the next big thing. “There are new developments every day, it is exciting,” he said. Philip won a GIZ scholarship to carry out his research project at the International Centre of Insect Physiology and Ecology (ICIPE), Kenya. He sought to develop a storable diet for the desert locust that could be used for mass rearing. The desert locust is consumed by humans and can also be used as an animal feed supplement. He tested five different formulations for human food. They mainly consisted of powdered cowpea, cornmeal, soy bean and carrots in different ratios. Some were enriched with multivitamins. Two diets worked well. “My findings are a starting point for optimizing diets with a longer shelf-life for insects,” he explains. What is the future of insects as food and feed? Philip is confident that there is high potential for insects as food for the future. They can be produced en masse using organic waste. Nitrogen emissions could be reduced by supplementing livestock diets with insects. I asked him how we can get people to consume insects? “We need to get the conversation going. Constant sensitization on the nutritional benefits and the environmental impact will change the narrative. People will eat insects, eventually,” He said, passionately. He also admits that scientists play an important role in advocacy for insect consumption. Philip is currently pursuing a Master in Biosystems engineering degree at Wageningen University, Netherlands. I was curious to know how he plans to apply his engineering skills to rear insects for food and feed. His ultimate aim is to design and develop efficient insect production systems.